Yazmin is the youngest of six and grew up in Anaheim, CA. She was raised by immigrant parents and is a first-generation college student. The importance of higher education was instilled within her from an early age, along with a drive to overcome obstacles that would present themselves without parents or counselors to show her the way to college. Yazmin first attended Fullerton College where she studied English, became an activist within her community, got involved in the honors program and worked part-time. After 4 years, she transferred to the University of California, Los Angeles (UCLA), where she majored in Comparative Literature. While a student, Yazmin worked as a peer mentor at UCLA’s Center for Community College Partnerships. As a peer mentor, Yazmin was able to pass the torch and help more students that are first generation have a better opportunity to transfer faster and continue their education instead of getting lost or discouraged in the transfer process. 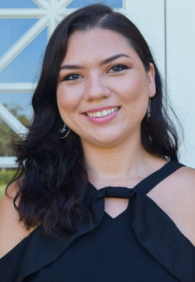 Upon graduating with her bachelor’s, Yazmin returned to Orange County to give back to her community as a college access mentor and coordinator for underserved and first-generation high school students at the Nicholas Academic Centers (based out of Santa Ana, CA). Yazmin’s long academic trajectory has allowed her to find her true passion in higher education and how transformative it can be in one’s life. She’s looking forward to helping more transfer students find a home at Chapman University, where they can thrive, find community, and give back in their own unique ways. Be your #1 advocate! Nobody knows you better than yourself. Always speak up, use your voice, and ask questions. Going through the college process, and college itself, means doing many things on your own. It is important to realize that though you might feel alone with all this freedom, you have to seek those resources, professors, mentors, and counselors to build a strong support system. I really like passing by Chapman’s very own section of the Berlin Wall on campus because it’s so historical and symbolic. It reminds me to always be a conscious global citizen and learn about the past in order to carry on into a better future. Being able to work with such a great team in Admission means there is never a dull day. I’m glad to be surrounded by passionate people that make every day just as fun and memorable. Role Model: My parents. My dad has allowed me to challenge gender stereotypes growing up and taught me to always speak up and find the power of my voice. Meanwhile my mom instilled within me the importance of my Mexican cultural roots and loved to use the weekends to teach me how to cook, in order to bring our family together for example. Favorite Musical Performance/Band/Composer: Jim Morrison is one of my favorite musicians because my brother and I really bonded with music from The Doors when I was growing up. Few people know how well-versed Jim Morrison was as a talented singer, icon, poet, and a film major! My Most Prized Possession: My 6th grade diary. It’s hilarious to read back on some of those entries and laugh about it now. It was definitely a weird phase of my life to document. Favorite Summer Activity: Camping by far is one of my new favorite activities. I love being able to unwind in nature without technology to depend on or distract me. The smell of campfires is probably one of the best smells in the world for me. Best Movie Of All Time: Get Out directed by Jordan Peele is one of my recent favorite movies of all time. It’s thought provoking, comedic, a thriller...basically a bit of everything which I love.